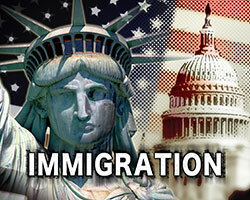 An immigration attorney in Los Angeles doesn’t just help individuals become citizens of a new country. These individuals can also help prevent you from being deported by defending your case in front of the judge. Lawyers can also give you legal advice about obtaining your work visa if you are planning on working in a country for quite some time. For students who are planning on studying abroad, it is important that you speak with an attorney to get the proper visa in place as quickly as possible. Our team at the Law Offices of Shahin Motallebi can also help you obtain citizenship by way of naturalization. To do so, you will have to go through a Civics and English test and receive multiple appointment letters to obtain your citizenship. By having all of these things in order, you can make sure you get to stay in the country and don’t end up finding yourself fighting to keep everything you worked so hard for over the years. Since it can take as long as seven years to become a citizen in the US, you want to have someone working on your side who understands the specifics involved with the whole process. At the Law Offices of Shahin Motallebi, we understand the laws and what it takes to get you through the process as quickly and efficiently as possible. We will help you submit all of the necessary documentation to prove your case in front of the courts. We will also work to minimize delays along the way. In the event there is an emergency that requires you to travel to another country and stay there for an extended period of time, our professionals can help you get the documentation you need to stay there legally. When hiring an immigration attorney in Los Angeles, you need to be confident in the fact that you are hiring someone who has your best interests at heart. Don’t turn to just anyone. Turn to someone you can trust who is willing to listen to your needs and develop a plan that is going to work for you and your specific situation. Contact our team of dedicated specialists today to begin the process. Immigration Attorney serving Los Angeles, Beverly Hills, Studio City, North Hollywood, Santa Monica, West Hollywood, Culver City, Playa Del Rey, Venice, Pacific Palisades, Marina Del Rey, Sherman Oaks, Van Nuys, Encino, Universal City, Valley Village, Inglewood, Burbank, Tarzana, Toluca Lake, Panorama City, Pacoima, Topanga, El Segundo, North Hills, Reseda, Northridge, Glendale, Woodland Hills, Canoga Park, West Hills, and Winnetka areas.